Karli is originally from Milwaukee, Wisconsin. She joined Girls Leading Girls in 2017 as a head coach and SF Sol program manager. Karli recently joined our 03/04 SF Sol Travel team to Gothenburg, Sweden for the Gothia Cup over the summer. Karli attended Loras College in Dubuque, IA where she majored in International Studies and Politics. In 2010-2011, Karli played soccer for Loras College, where they were conference Champions and made it to the second round of the NCAA tournament. She ended her soccer career after the season due to multiple ACL/meniscus surgeries. However, she then played lacrosse for Loras in 2013 and 2014. She was captain and was awarded Most Inspirational Player after the 2013 season. The best part of coaching is connecting with the girls. Helping them on the field is awesome and watching them improve and succeed on the field is great. But the even more rewarding part is helping them become better versions of themselves. Helping them see that they are stronger than they think, that they can push themselves farther than they think they can go, and learning that they are leaders in their own way is the most rewarding. I have had my fair share of bad coaches, and I know that I do not want other girls to have to have coaches who will make them hate the game. I still love the game because of the couple great coaches I did have. I learned what kind of coach I wanted to be which is a positive and encouraging coach. And at the same time I am serious about helping them become better players. What does coaching mean to you? Coaching is so much more than just the game. It is about their future. Teaching these girls healthy habits, how to play the game safely, how to do technical skills properly, teaching them good sportsmanship, teaching them how to be a good teammate is so important to me. Helping them grow is the best part about coaching. What motivated you to play collegiate soccer? I wanted to be the best athlete I possibly could be. I pushed myself harder than anyone else. I was my toughest critic. Since I was 13 years old, I have had 6 different knee tears and 4 surgeries. I learned how hard it was to be on the sidelines. Whenever I was healthy I never took anytime I had on the field for granted because I knew what it was like to not be able to play the game that I loved. I lost a total of about four years due to the injuries, surgeries, and recovery times. So when I made it to college, I did not take anything for granted. I not only had regular two hour practices a day, but I also did weightlifting, conditioning sessions with my athletic trainer, and then pre- and post- sessions with the athletic training in order to keep myself and my injuries healthy. I did not want to let myself down and I definitely did not want to let my teammates down. What helped you stay disciplined as a student athlete? Part of being a student athlete is the academics. Academics should be just as important as the sport you are playing. So as much time I spent working on my game, I also spent the same amount, if not more on my studies. I worked extremely hard in college. I made the Dean’s list every year. I also participated in missions trips and social justice trips domestically and internationally. I was just as hard on myself when it came to academics. One of my biggest fears is not fulfilling my potential. I never wanted to squander my academics or athletics because I did not waste any of my potential. I continue to push myself every day so I can reach my full potential! What do you hope to change about the world? I hope to change people’s attitudes with one smile at a time. I am a positive person who wants to believe the best in people and in the world. I know I cannot clean all the oceans of the world alone. I know I cannot solve world hunger alone. I know I cannot stop all the wars and fighting alone. But maybe by sharing my positivity with the people around me, I can change people’s thinking. Help us care for one another no matter what religion, ethnicity, economic background, gender, or sexuality. Because when we all feel important, then we all feel like we can make a difference. And together, we are stronger. With one smile, you can turn someone’s day around. Simple acts of kindness, is how I choose to try to change the world every single day. Those little acts can help make a great difference when enough people have been touched by kindness. Karli has coached at the Julie Foudy Sports Leadership Academy (JFSLA) in New Jersey, Illinois, Georgia, and California every summer since 2011. She has worked with girls ages 9-18. At JFSLA, the coaches focus on teaching the girls soccer skills, but also teaching them about leadership on and off the soccer field. Throughout the years, Karli has had the opportunity and privilege to learn under former national players, current professional players, college coaches, and club coaches. In 2016, Karli was chosen along with nine other JFSLA alumni to represent the United States and the Julie Foudy Sports Leadership Academy in India. This opportunity was funded by the State Department. They were teamed up with Magic Bus, an organization that works with boys and girls in the slums across India. Abroad the JFSLA alumni had the chance to learn more about Magic Bus, visit the slums, and work with boys and girls on and off the soccer field. My name is Jennifer Lopez-Valencia and I'm 11 years old in 6th grade. I started playing soccer with Girls Leading Girls in 4th grade. "When I was in 4th grade at E.R. Taylor Elementary I joined the Girls Leading Girls after school program. 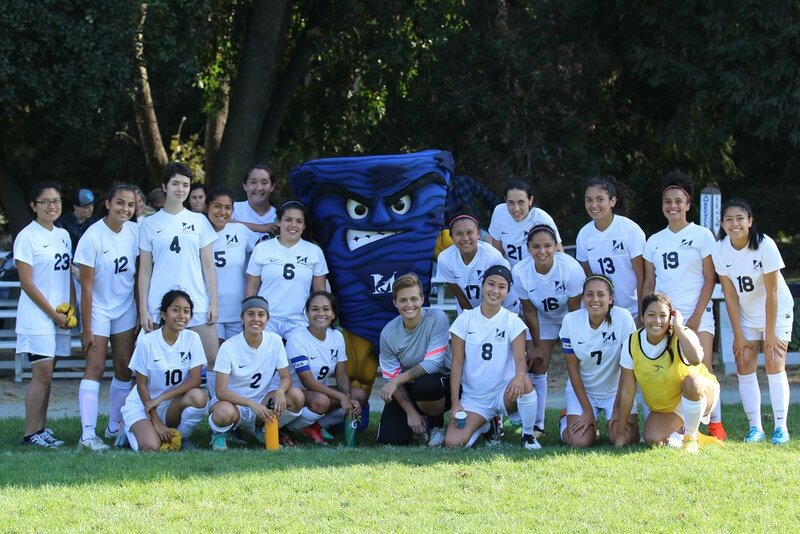 I joined because I wanted to try something new because I never really got an all girls soccer experience before. This was the first time I had a female coach and it feels better because the coaches are more understanding. Since then, I was offered a scholarship to play on the Girls Leading Girls Sf Sol Club competitive team. This was the place for me because before it was harder to fit in with the boys on the coed team I played on before. I'm now in 6th grade at St. James in San Francisco. When I"m older I want to be the Director of Kaiser! I like helping people and I always take care of my 9 year old brother when he's sick- I just know what medicines to give him now. I definitely want to play soccer in high school and college. I hope I can get a scholarship to play in college. Since being part of Girls Leading Girls I feel more confident, I feel like a leader, and I feel like I can express myself."